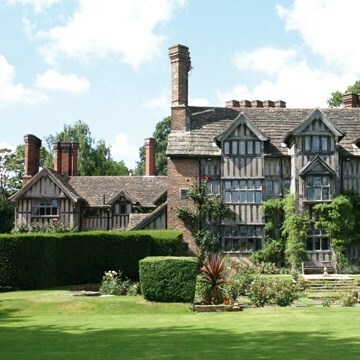 On the hottest day of the year, the Friends visited Great Ote Hall, a Grade I listed timber framed house in Wivelsfield, set in lovely gardens with far-reaching views over the 300+acres. The group was welcomed by the owner, Carola Godman Irvine, and treated to coffee with especially delicious cakes. The history of the house, the family story and aspects of the architecture, were described by Christopher Whittick, who had set out concise details in a handout, distributed to members. ​The manor of Ote Hall was held of the manor of Withdean Cayliffe in Patcham by a yearly quitrent of 15 shillings. After the death of Major General Richard Temple Godman in 1912, the house was bought by Mr Herbert Woods, who then sold it, in 1923, to Mr Roderick Eustace Enthoven. The latter died in 1936, following which, his son sold Otehall to the Godman trustees, so that the manor is again held by the Godman family. More recently Thomas Ellison Godman lived here with his wife Valborg until his untimely death in Malta in 1942 when he took a direct hit on board the ship he was commanding. Valborg Godman subsequently married Sir Bryant Irvine and lived here and ran the farm until her death in 1990. Bryant Godman Irvine died in 1992.The present occupants are their daughter Carola Godman Irvine and her children Matthew, Charley and Nina. According to Nevill, the house was built in two stages, the East block and later the more elaborate West block. Nevill describes the resultant changes and rearrangements within the house; number and style of windows and removal of external plaster to reveal old timbers, the moving of a staircase, altered function of rooms etc. He mentions the ‘nice Tudor fireplaces’ and ‘nice oak panelling’. One of them has ‘a good carved mantelpiece, with inlaid initials and date, TMG 1609, no doubt the date of the panelling and refitting’. He goes on to say that, apart from the two just mentioned, all panelling and mantels, plus an oak door, were collected from old houses in Guildford and Godalming, now demolished. He also describes in lurid detail, not for quoting, the very unsanitary sanitary arrangements! The important conclusion is that the house ‘presents an unusually complete example of the smaller country house of the 17th century’. Following from Christopher’s talk, Carola Godman Irvine very kindly addressed the group giving her personal view on many aspects of the house. She brought to life her experience of living there with her family, whilst running the farms, and the wedding venue business. Members were then invited to tour the house with Carola, in three consecutive groups of 12, and were able to see the house and its many striking features; the full height post, the oak four poster bed, the fireplaces, the original detailed map of the manor of Ote Hall (a copy of which was included in the handout) and more. 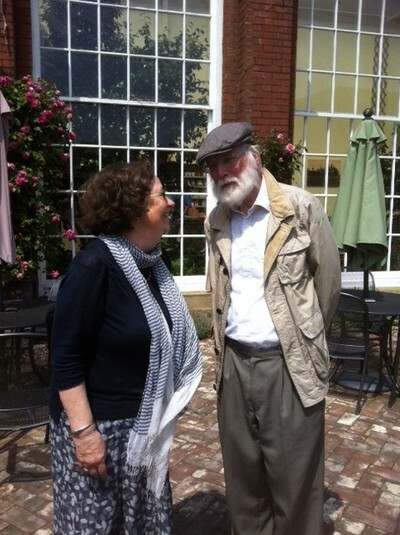 Members felt privileged to see the house and wonderful grounds at close quarters, and to have their history so vividly brought to life by Christopher and Carola. The visitors – many, themselves, learned historians with continuing research interests - were hugely appreciative of the impressive knowledge and exposition of the story of the house. Lady Teviot gave a vote of thanks for a memorable visit. ​The Friends gathered at the gatehouse leading to Green Court at Knole ready to meet Lord Sackville who had very kindly agreed to show the group the private rooms (not open to the public) before seeing the public National Trust rooms. Would he find us, among all the other visitors, in this great English house? 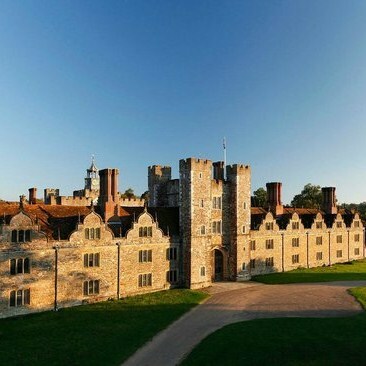 In the mid 15C, Knole was built by Thomas Bourchier, Archbishop of Canterbury, on the site of an older house. It later came into the hands of the Royal family in 1566, when it was leased by Elizabeth 1 to, among others, Robert Dudley, Earl of Leicester. Her cousin, Thomas Sackville, was eventually able, in 1603, to buy the freehold. From then, Knole became the principal seat of the Sackvilles, whose descendants - the Earls and Dukes of Dorset and Barons Sackville – have lived there from 1603 to the present day. The Earls and Dukes of Dorset owned large estates in East Sussex - Withyham, East Grinstead and Ashdown Forest. Following the premature death of the fourth Duke, the house passed, through one of his sisters, to the family of Earl DeLaWarr. In a complicated family arrangement in the 1860s and 1870s, the Sussex estates and Buckhurst at Withyham remained with the senior branch of the DeLaWarrs, but Knole passed to a younger son of the family, to whom the title of Lord Sackville was granted in 1876. Both the title and the house could pass only through the male line; hence Vita Sackville West, renowned poet, author and garden designer, born at Knole in 1892, as the only child of the third Lord Sackville, was unable to inherit, despite her great love of the house. The house was given to the National Trust in 1946 by the fourth Lord Sackville. The family negotiated a 200 year lease of the private apartments, and a large proportion of the grounds. The main apartment is now occupied by the current (seventh) Lord Sackville, his wife and children. Lord Sackville is the author of two books about his family, one of them (‘Inheritance’) telling the story of Knole and the family from early 17 C. The Friends, and their guests, were therefore delighted to have the opportunity, for more than an hour, to visit his private apartment, not otherwise seen by the public. Lord Sackville did spot the group in Green Court! We were taken off to the private apartments, leading from Bourchiers Tower,￼where we were privileged to hear Lord Sackville give a most impressive expert exposition of the story, the art, and the ancestors. ​This chapel is also home to the probably the oldest playing organ in England, and we heard it! Vita Sackville-West was married here in 1913 to Harold Nicolson. We also saw the formal, panelled family dining room; spacious and ornate, and known as Poets’ Parlour, from the many portraits of poets and other eminent figures of later 17th Century England – Congreve and Dryden, Pope, Swift and Addison. Moving on, we saw the stunning formal Colonnade Room, (painted throughout with grey and silver trompe l’oeil,) and boudoir, both with furniture, ceramics and portraits, from 17th to 19th Century. Of all the paintings that we saw, one in particular was unforgettable. This original painting, by Cornelis van Haarlem (1562-1638) had been newly restored. It was very large and very radiant. The title, Allegory of the Arts and Sciences with a portrait of Jan Govaerts, focuses the on the shell collector in the centre of the painting; but the inscription in Hebrew on the man’s hat on the right, is Image of Peace, with Peace herself seated on the left, an allegory for the flourishing of the arts in times of peace. (Note: the illustration above is probably of the version in Lacock Abbey/Fox Talbot Museum – ‘after Cornelis van Haarlem). The ‘French Library’ was filled with shelves full of leather-bound books from the same period, and a table overflowing with Victorian photographs of the family. Amongst the treasures, there was the delightful incongruity of a modern kitchen, a teenaged boy’s drum kit, tee shirts and other family paraphernalia. Each room was so saturated in history and beauty, but the remarkable presentation by our host, ensured that we all left the apartments much more knowledgeable than before. Lord Sackville answered many questions about the family and the collection, including a final one posed by Christopher Whittick – do you enjoy living here?! CW then thanked Lord S for generously giving his time to make our visit to Knole such a resounding success. It was a privilege and pleasure to see the private rooms at Knole at close quarters, and to have their history so vividly brought to life. After a break for lunch, the members were free to visit the public rooms of the house, some of which were closed as a result of the massive renovation exercise currently being undertaken by the National Trust. Several of the group were very fortunate to be given a guided tour of the state rooms that remain open, by a FoTKA member, Stephen Hale, himself a volunteer steward for the National trust at Knole. Members could also climb the recently opened Gatehouse Tower, where Edward Sackville-West, 5th Baron Sackville lived for a while, and to see, among other fascinating memorabilia, a fine portrait by Graham Sutherland. ​June 6th was a lovely day, perfect for visiting and enjoying Ashburnham Place; the house, gardens and lakes, as well as the beautiful church of St Peter. We were met, in what had been the main entrance hall of the old house, by the welcoming staff of the Ashburnham Christian Trust and shown to the main hall, where generous helpings of delightful refreshments were served. Christopher Whittick and David Martin gave us an outline of the history and architecture of the house, and details of the family. We were privileged also, to have with us Mr Richard Bickersteth, whose father had inherited the estate in 1953 from Catherine Ashburnham. His account and direct personal connections added an extra dimension to the story. Ashburnham Place was the home of the Ashburnham family from the medieval period until 1953, although the history of the family stretches back to the pre-conquest era. We were provided with a family tree from the 14th Century some original documents related to an early John Ashburnham, the common family name. The family became wealthy from land holdings and the Wealden iron industry. The family had a colourful history with close links to Royalty, most notably between John Ashburnham (1603-1671) and Charles 1, when Ashburnham Place was brought to near ruin by Parliamentary attacks. Later, Bertrand, 5th Earl of Ashburnham (1840 -1913) was the English agent for the Spanish Carlist cause. Of the earliest known house, only the cellars remain on the site, abandoned in the 16th century and probably confiscated by Queen Elizabeth I. 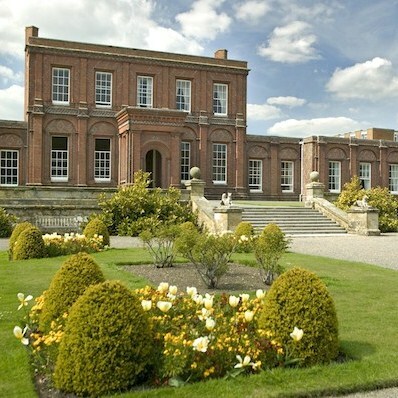 The Ashburnham family recovered the estate under Charles I, and built the house to its present form in 1665. It was the subject of enlargement and many improvements over the following centuries. Over the years the estate has changed a great deal and we were given three plans dated 1638, 1717, and 1797. In 1638, the house appears quite large, built in a square, with a large courtyard in the centre, but with very little land. By 1717, the house is much smaller but with more land much of which was forestry. The estate in 1797 is much enlarged with land in all the surrounding parishes. The drawing below shows Ashburnham Place in its heyday. ​A drawing by John Preston Neale of Ashburnham Place in 1828 showing the lake. By the late 19th century, the family was under financial pressure, and by mid C20, the house had reduced to a state of decay. The estate, however, remained in the family until the death, in 1953, of Lady Catherine Ashburnham, the niece of the sixth (and last) Earl, Thomas Ashburnham. ​After her death, the Rev J Bickersteth, a grandson of the sixth Earl, inherited the estate, with its plethora of financial problems. Possessions were sold at Sotheby’s immediately, and later, in 1959/60 a section of the house was demolished, reducing the central section to two floors and the wings to a single story. The house and grounds and some land remained and were gifted by Rev John to be a Christian Trust which continues today. We were able to visit the grand rooms that remain, with their rich plasterwork and marble fireplaces, now used for meetings, retreats and prayer days. Despite everything, the Ashburnham House retains a Grade II listing. After absorbing all the information in the wonderful presentations, everyone was ready to absorb further refreshments! 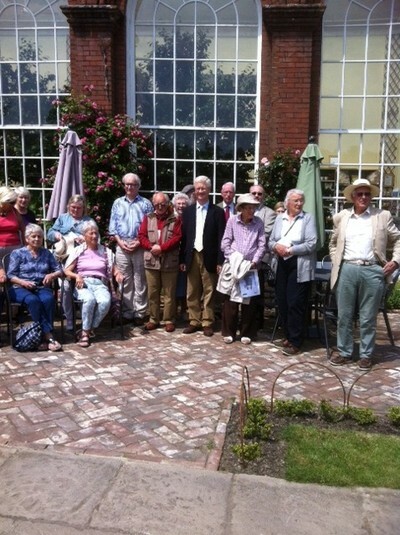 So energized, the group was taken to see the old stable block and dairy, now restored for other use, and the beautiful grounds and gardens (200+ acres), designed by Lancelet (Capability) Brown. Also designed by Brown, the Orangery c1767, houses the oldest camellia in England. One last treat remained, the Church of St Peter, adjacent to the house. We were free to wander round this fine, compact Grade I church with chancel, north and south chapels, nave, north porch and west tower. The tower is C15 showing the Pelham buckle. The remainder of the building would seem of the same date but was actually rebuilt by John Ashburnham in 1663 and is one of the best examples in England of the Gothic style continuing after the Gothic period was over.The interior retains all its contemporary C17 fittings: eg the iron screens to chancel, chapels and tower, the communion rails, pulpit and marble font. The north chapel is the Ashburnham mausoleum chapel and contains two very good C17 family monuments, one by Bushnell. Richard Bickersteth was there to help us with more detail.